Raffle tickets are available for $25. Entry deadline is May 31st. Only 600 ticketsavailable! EVERY dollar goes to the American Cancer Society! 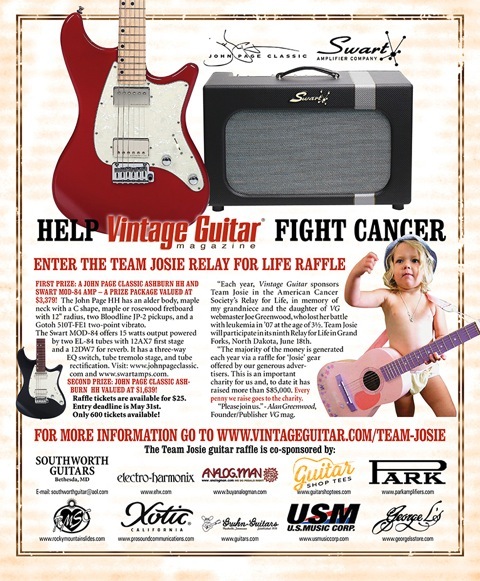 Each year, Vintage Guitar sponsors Team Josie in the American Cancer Society’s Relay for Life. Josie, my grandniece and the daughter of VG webmaster Joe Greenwood, lost her battle with leukemia in ’07 at the age of 3½. Team Josie will participate in its ninth annual Relay for Life in Grand Forks, North Dakota, June 18th. The majority of the money is generated each year via a raffle for “Josie” gear offered by our generous advertisers. This year, John Page Classic is stepping up with two Ashburn HH guitars! The first prize winner will receive Swart Amplifier Company’s Swart MOD-84 amp in addition to the John Page Classic Ashburn HH – a prize package valued at $3,379! The second prize winner will receive a John Page Classic Ashburn HH valued at $1,639! This is an important charity for us and, to date it has raised more than $85,000. Every penny we raise goes to the American Cancer Society. The American Cancer Society on behalf of Team Josie. 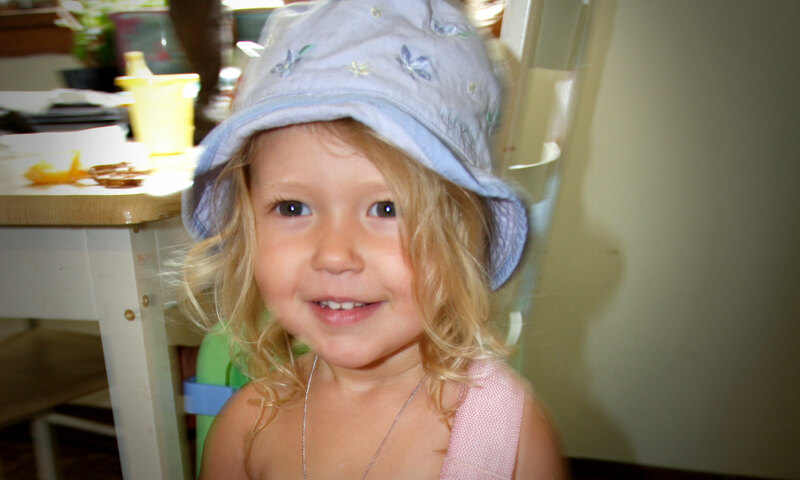 Josie Greenwood is a sweet little girl who died of Leukemia in 2007 at the age of three. JosiesHope.org is this website, created and maintained by her family, as a multi-purpose gathering place for sharing Josie’s story, creating awareness about childhood cancer, and raising funds in the fight against cancer. Josie’s Hope is an unofficial fundraising organization started by Josie’s family in Grand Forks, North Dakota. We are currently raising funds for The American Cancer Society’s Relay For Life 2016. Team Josie originated with the 2008 Relay For Life event in Grand Forks, North Dakota, and we continue to celebrate and participate in this wonderful annual event. You can learn more about Team Josie by clicking here. Over the past several years, many people have responded to Josie’s story with tremendous acts of kindness and inspiration. Our friend Kristen Abner has run several marathons in Josie’s name as part of The Leukemia and Lymphoma Society’s Team in Training, which has in turn inspired Josie’s aunt Karen, and as you will see, many others, to similar acts of heroism. As a family, we still dearly miss our little Josie. We continue to struggle with her loss on a daily basis, and we know we are only beginning to process the absolute shock and sadness that struck us several years ago. We question our spiritual faith in life, as well as the makeup of our physical environment. Our hope is that through our work here, with Josie’s Hope, with The American Cancer Society, with The Leukemia and Lymphoma Society, and with the help of our family and friends, we can heal ourselves and make a difference in the lives of those affiliated with childhood suffering. Thank you for visiting our website, and be sure to check back occasionally to see how things have changed. Please feel free to call us or send us an email, and please consider making a donation to The American Cancer Society to help aid the fight against cancer.